In The House of the Seven Gables, the character Holgrave inhabits rooms in a distant corner of the house, a situation that reflects his attempts to present himself as an outsider and critic of the status quo. He first appears in Chapter 3 of the novel, but little is revealed about his background or origins, and he seems content to allow the mysteries about his past to go unexplained. He frequently questions the aristocratic sensibility of Hepzibah Pyncheon and expresses his desire to escape the past, its influence and legacy. He professes sympathy with democratic ideals and is rumored to associate with radical figures. Although he claims to have no interest in the past, Holgrave remains unusually pre-occupied with the stories of the inhabitants and history of the Seven Gables. His fascination with these stories as well as his presence in the house cause the reader to wonder what his connections to that history may be. Late in the novel, the reader discovers that Holgrave is a Maule, a descendent of the original owner of the property on which the Seven Gables stands. His need to have lived under an assumed name and to obscure his own past reflects aspects of the alienation that Holgrave feels through much of the novel. Holgrave presents himself as a jack-of-all-trades, but two of his pursuits reflect his artistic sensibility. He has worked as a daguerrotypist, practicing an early form of photography, and he has written the story of Alice Pyncheon, which he hopes to publish in a magazine. When Jaffrey Pyncheon sits for a portrait, Holgrave finds that he cannot capture a pleasing likeness of him and speculates that Jaffrey is not the man he seems to be in public. His ability to read Jaffrey suggests Holgrave's artistic perception. When Holgrave recites the story of Alice Pyncheon to Phoebe, he also reveals that he has the Maule gift of mesmerism. Hawthorne suggests, however, that Holgrave's ability to mesmerize Phoebe may come from his artistry with words rather than a supernatural power. Holgrave distances himself from his Maule ancestors by not taking advantage of Phoebe while she remains under his influence. 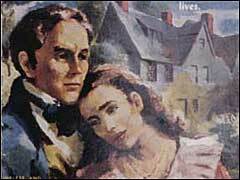 His love for her prevents him from doing her harm, but he is aware of the temptation to probe another's heart for its secrets, a theme Hawthorne addressed in many of his works. Some critics feel that Hawthorne projected aspects of himself into Holgrave's character, especially his desire to position himself as an outsider and an observer of others. The seeming change in Holgrave's character at the end of the novel has troubled many readers. Not only does he reveal himself to be a Maule descendent, but he embraces the ideas about property and status that he had rejected earlier in the novel. Hawthorne has hinted that Holgrave has an attachment to the land through his gardening, but the ideas he expresses late in the novel about building a house that will last strike some readers as artificial. Holgrave also appears ready to abandon his art for the life of a country gentleman-farmer, another change that readers find disturbing. Hawthorne suggests that Phoebe's love has transformed Holgrave, allowing hidden aspects of his self to be acknowledged and drawing him toward wholeness and community. The reader might ask whether Hawthorne suggests that an artist requires a degree of alienation from his or her community to exercise his creative abilities.